So, I have a confession to make to you: I love Caffè Florian. I know, I know, I know...it's incredibly expensive so say the guidebooks, and only tourists go there. But if you think Caffè Florian is expensive now, imagine how expensive it would have been in the past. Nowadays we consider coffee and chocolate to be everyday food stuffs, but when Caffè Florian opened in 1720, both drinks were luxury items for the wealthy, and coffee houses served as exclusive meeting places for the nobility and socialites. Coffee first reached the Arabic world from Ethiopia and was being cultivated in the middle east from the 14th century. By the 16th century, coffee had become available in Persia, Turkey and northern Africa. Venetian merchants first introduced coffee-drinking to the wealthy in the 1600s, and the first coffee houses opened in Venice in the 1650s. Around the same time, the Florentine merchant Antonio Francesco Carletti broke the Spanish monopoly on chocolate by bringing back fruits of the cocoa plant from the Spanish colonies in South America in 1606. By the 17th century, artisans in Venice, Florence and Turin had become experts in the preparation of chocolate. It was costly, and remained a beverage of the elite until the Industrial Revolution. 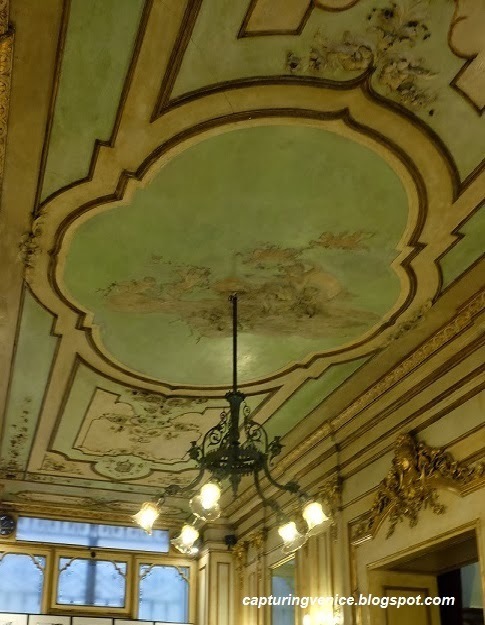 Floriano Francesconi opened Caffè Florian in December 1720 as Caffè alla Venezia trionfante (the Café of the Triumphant Venice). This original cafe comprised two simply furnished rooms, and from the start, served the finest coffee, hot chocolate and wines imported from Malvasia, Cyprus and Greece. Its popularity grew, and during the 1750s, the cafe expanded to four rooms. Carlo Goldoni (1707 – 1793) and Casanova (1725 – 1798) were amongst the café’s famous patrons during this period. 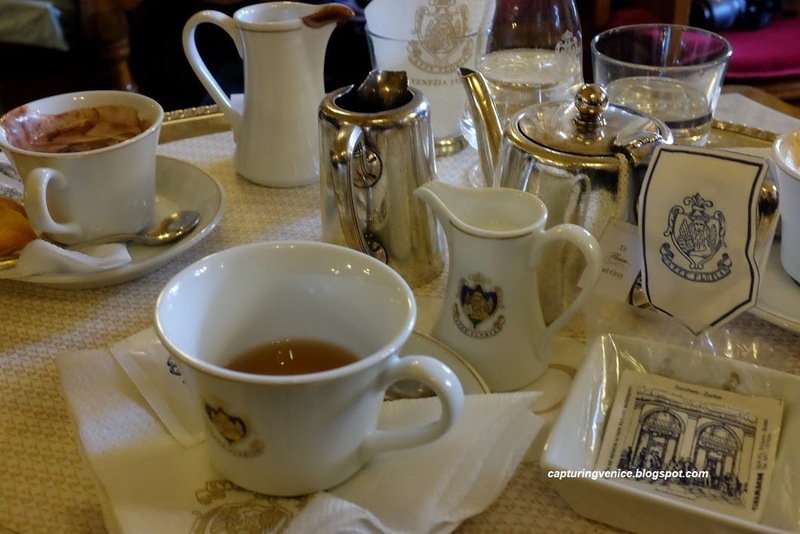 The first time I experienced Caffè Florian was on a visit from Switzerland with my boss, who kindly treated me to drinks as the sun set over the Piazza and the crazy band competition between Caffè Florian and Caffè Quadri was in full flight. Years later, when I was in Venice with my own staff, I remembered my treat from all those years ago, and took my small team for a prosecco to mark the end of another mad Biennale stint. It was fabulous. The lights shone on the Basilica, there were hardly any tourists in the square, the music by the band was merry and fun, the drinks were cold and bubbly, and it felt like a suitably celebratory way to acknowledge the effort and dedication of our team. 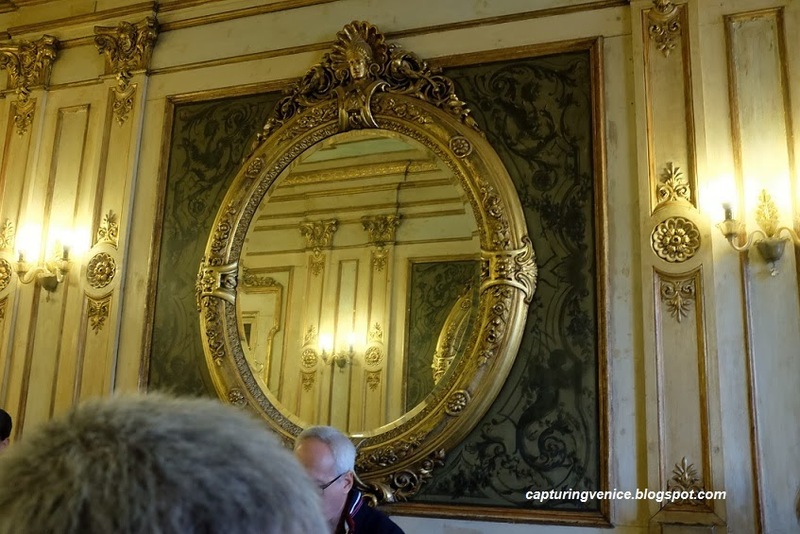 So when I brought my husband to Venice in October last year, a quiet drink at Caffè Florian's was high our lengthy 'to do' list. 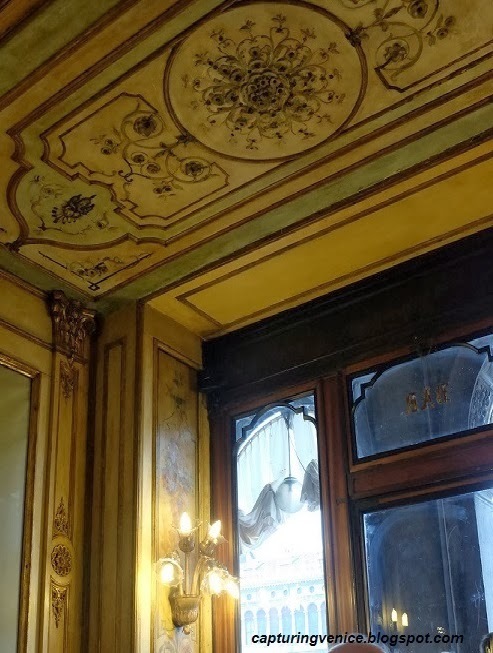 And, as I'd never actually sat inside, I spent quite a bit of time studying interior views of Cafe Florian on the internet and deliberating which room I liked best. Except that I couldn't decide - I really like them all. The Sala degli Uomini Illustri (Hall of the Industrious Men) with paintings by Giulio Carlini of ten Venetians – Goldoni, Marco Polo, Titian, Francesco Morosini, Pietro Orseolo, Andrea Palladio, Benedetto Marcello, Paolo Sarpi, Vettor Pisani and Enrico Dandolo. (As part of the 2003 Venice Biennale, the Austrian artist Irene Andessner temporarily replaced these portraits of men by photographs of herself portraying ten notable Venetian women including the courtesan and poet Veronica Franco, portrait artist Rosalba Carriera and Elena Lucrezia Cornaro Piscopia,the first woman in history to obtain the degree of Doctor of Philosophy). The Sala del Senato (Senate Hall) with panels showing scenes from the arts and sciences. Apparently it was in this room that the idea for hosting the International Exhibition of Contemporary Art of 1893 in Venice was formed – and it was this small exhibition that has grown into what we now know as the Venice Biennale. The Sala Cinese (Chinese room) with its paintings of gorgeous women and their lovers and the Sala Orientale (Oriental Hall) depicting more gorgeous women in harem trousers and tunics. 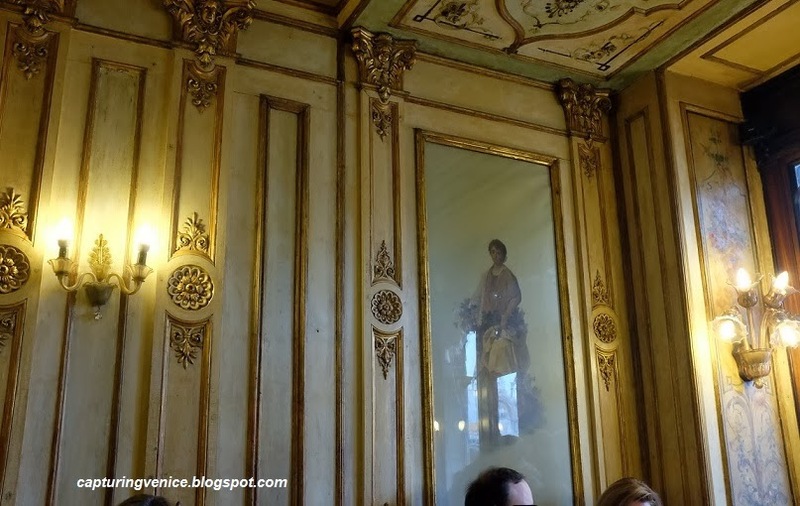 The Sala degli Stagioni/ degli Specchi (Hall of the Seasons or of mirrors), a long, narrow room with mirros and paintings of women depicting the four seasons. We ended up escaping the rain and cold by ducking into Caffè Florian's twice during our week-long trip. On the second visit, it was a busy Saturday morning and we were seated in the Sala degli Specchi. I can't go past a silver pot of filled with earl grey tea leaves on a wintry day. I was delighted that my usually very health conscious husband ordered the famous thick, rich hot chocolate and let me steal a couple of sips. Cornstarch mixed with water is added to the simmering chocolate to create a thick, creamy, delicious, rich cup of liquid chocolate flavoured with vanilla, sugar and cinnamon. this love that I have for thedaughter of cocoa,cinnamon, sugar and vanilla;I would go three hundred miles barefoot just to drink a little cup of it.…I would give up all beverages –I would give up tocai, and malvasia –and the whole geneaology of winesif I could only be given that holy liquor which touches my heart,which only to name it makes my mouth water. Oh what a lovely place, I have been always dreaming of something like that! Many thanks for the lovely post, really made me dream! Thank you for stopping by, Nespresso. I'm glad you enjoyed the post!